Veterans Park on Okaloosa Island remains one of my favorite parks throughout Florida, a beautiful array of Choctawhatchee Bay views, towering pines and freshwater ponds. That Veterans Park tops my list is really saying something – I’ve visited over 100 Florida state parks in the last two years alone. On a recent visit, I made a slow loop around its half-mile boardwalk. I marveled at the sugary sand dunes, over 25 great blue herons sheltering from the wind in the ponds, and a gorgeous great horned owl asleep in one of the tall pine trees. In only half an hour, I spotted 17 bird species and over 100 individual birds. Despite the construction noise from nearby Wild Willy’s, the birds remained, and the park is also a haven for a wide variety of butterfly species, including the monarch, as well as turtles, frogs and more. Such protected barrier island areas are rare and should be preserved into the future, not only for locals like us to enjoy but for tourists as well. According to the U.S. Fish and Wildlife Service, over 45 million people annually watch birds around their homes or during their travels, and birders spend more than $40 billion on trips and equipment in a typical year. Local communities receive nearly $15 billion on incidentals as a result of birding trips, including food, transportation and lodging. 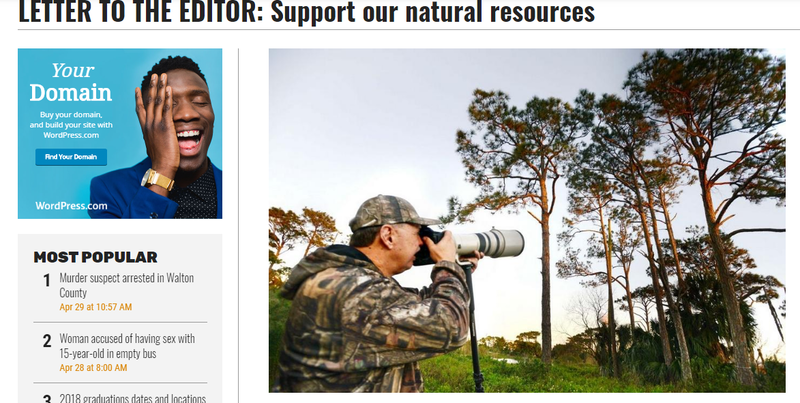 Florida’s Space Coast Birding Festival alone garners over $1 million in just five days. Okaloosa’s parks and tourism development departments have a plan in place to improve Veterans Park while doing as much as they can to protect the birds and wildlife within the park’s borders. As citizens, we should support this natural resource and encourage locals and visitors alike to enjoy the impressive natural wonders we have right at our doorstep. See the article at NWF Daily News.